Story: Happy New Year readers! - Today's post is about "the power of today".... I know you all have channel O and Dr. Phil for such things.. but hey.. 'ts the time of the year to reflect a bit. I bet you have a cousin or an uncle or a neighbor who is older than you and a line they always have to say is "Enjoy while it lasts.. because once you ---fill the next stage of life here--- it is all downhill..". For these people what the next stage of life is - is irrelevant. once you get a job.... really .. it does not matter! The very important point they are making is - "it is all downhill from there!" If you think about it.. their message is quite positive actually. They are saying - they are kinda miserable in life.. but from their perspective, your life looks pretty darn good! so you should enjoy whatever your current stage of life is!! So friends - recognize the power of today, eat this chocolate truffle that I made for new year's party and ENJOY life! Heat the cream in a small saucepan until it just boils. Turn off the heat and allow the cream to sit for 20 seconds. Pour the cream through a fine-meshed sieve into the bowl with chocolate. With a wire whisk, slowly stir the cream and chocolates together until the chocolate is completely melted. If needed, heat the chocolate on indirect heat - e.g. on steam so that you can dissolve any leftover chocolate pieces. You want a really smooth paste of chocolate. Whisk in the orange flavored liqueur, if using, coffee, and vanilla. Set aside at room temperature for 1 hour. 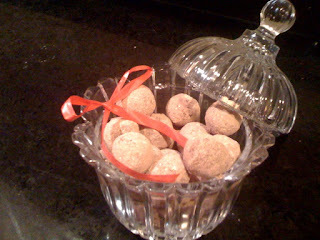 With 2 teaspoons, spoon round balls of the chocolate mixture onto a baking sheet lined with parchment paper. Roll each ball of chocolate in your hands to roughly make it round. Roll in confectioners' sugar, cocoa powder, or both. - I used both . hence the strange color of the coating. These will keep refrigerated for weeks (good luck resisting the temptation for weeks), but serve them at room temperature.